It was a Tuesday morning and the day was blending nothing special, just a regular workday like any other. Nothing was different, other than the fact that I was on my way to work 45 minutes earlier than my usual schedule when I reached the station to catch the train. I guess distance does not matter as much when you have long strides. The carts were not as crowded as most days and the sun was still fresh. The warmth from the rays was still friendly on the skin and it felt really good. So I got time, a commodity I have regained somehow as these moments were mine to own, and I’ve got nothing else to do but to just wait for my stop at the end of the line. I was sitting sideward to my left with my head resting on my knuckles with these aimless stares facing the window, looking at the mushroom billboards, car-infested highways and the cotton filled blue skies while most of the passengers on board if not all were in this very same state of blank thoughts and half consumed consciousness, commuting in silence, it was 6:20 am. It seemed like everybody agreed to disengage as if there was an implied understanding among us and the only imposing sound was from the crashing like noise that the train wheels against the steel rails were making. This reminded me of the terrible typhoon back in August. I closed my eyes and I was taken back, I open them again, and it was sunny. It was funny to note on how everybody else was unmoved by this, it was like everybody in the room was placed under a spell or to be more analytical, was a result of the preconditioned tendencies that dates back to early childhood. I almost forgot about humanity’s ability to adapt, on how we can learn to get used to some chaos. It is unspoken most of the times, yes, but it is also undeniable, the truth on how we can breathe to coexist with the most unforgiving conditions. So I shied away from all of this, and inside my compartmentalized head, I open each drawer, stretching both of my arms to reach for the higher shelves, to find these comforting thoughts from the other side of my delineation. I gave the cover cloth a good tug dropping one of the boxes on the floor. I untied the knot, blew the dust off the lid, and brushed away what’s left of the dirt with my backhand until the label was readable enough – “summer 1988”. Years of accumulated dust swarm around, within the beam of light coming in from the window. As I open the lid, a paperback photograph was sitting atop of the pile of handwritten letters, cut out newspaper articles, a transparent flashlight and a few banged-up toys, one of them was a cowboy on a horse which was very popular at the time. There in the photo was me and my brother on our first bikes. His was a tricycle which pedals were attached on the front wheel and was larger than the other two on the rear. It was made of plastic and metal, its body was blue and the wheels were finished in orange. Mine has four red wheels and it was made mostly of wood. It got no pedals and the seat came in blue with white stars scattered all over it, while the rest of its body was painted white. We had gray caps on and we were wearing our sando-undershirts and we had the look that we could ride those things anywhere we wanted. I had a conversation not so long ago. About how time changes us. On how circumstances replace everything and that childhood is like a cocoon covering that we outgrow eventually in life. But I don’t really believe that. The longer I looked at the photo, the more it felt familiar, the more it felt it was still me, that the child in that picture is still in me somewhere, that it wasn’t really gone. A door down the narrow hallway swung open. My attention was then captured by the newer boxes of memories stacked neatly in this special shelf from one of its aisles. I took a closer look, not minding the short walk that I had to take; after all, I have long strides. As soon as I got there, I opened one of the colored boxes, doing the same routine, tug, untie the knot and dust. But this time I was more careful. 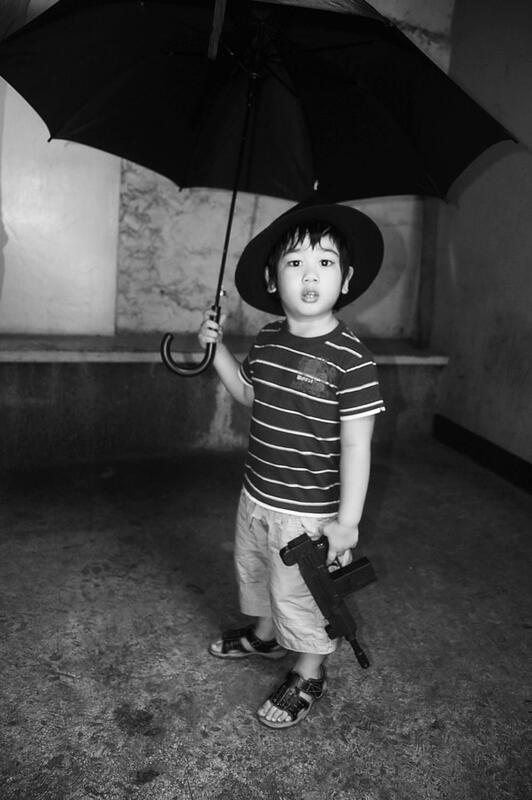 I then held a black and white photograph of a kid wearing a fedora hat under an umbrella with his Tommy gun toy. He reminded me of the boys from the other photograph. And from a crumpled paper note I read the words out loud on a whisper. Funny, it sounded like a line from a bumper sticker, but I guess there’s some truth to it. It was a Tuesday morning and the day was blending nothing special, just a regular workday like any other. And I have brought something back and I haven’t even reached my destination yet.